Last week I had the chance to connect with Richard Murphy, CEO of junior explorer Manitou Gold. We talked about the Gold market, the assets his company has, and their new partnership with GoldSpot Discoveries. On The Next Bull Market Move today I have a brand new guest. His name is Richard Murphy and he is the CEO of Manitou Gold. Welcome to the show, Richard. Thanks for having me Kerem. Let's begin by talking about your background and experience within the mining industry, and how you took up the role of CEO at Manitou Gold. Can you talk a bit about this? ﻿Yes, certainly. I'm a geologist by background from a major mining centre, based in Sudbury, Ontario. I grew up surrounded by mining and mineral exploration and I completed my studies at the university and graduate level in the mid '90s. For the past 25 years, I've been involved directly in mineral exploration and exclusively with junior mining and exploration companies, not major mining companies, strictly on the junior exploration side. I took up the role of CEO with Manitou at the request of the Board back in summer of '15. Let's go through some of the assets you have, which are located in Canada. I can see from your presentation that a lot of the claims that you have are surrounded by past producing and currently producing mines. It seems like you're in a great location for new gold exploration. I understand that there's already been a lot of exploration work on one of your projects, the Kenwest project. Can we start by talking about that? ﻿Yes, absolutely. There's an old, time-tested and proven adage that the best place to find a mineral deposit is in the shadow of a headframe (or an existing mine). Certainly at Kenwest, there's half a dozen past producing mines in the direct vicinity of our Kenwest patent lands. Those date back to the turn of the last century, originally worked around the 1900 period. And then again, before the second World War, so there's a period, from about 1936 and ending basically at the end of the war of the second round of production there. 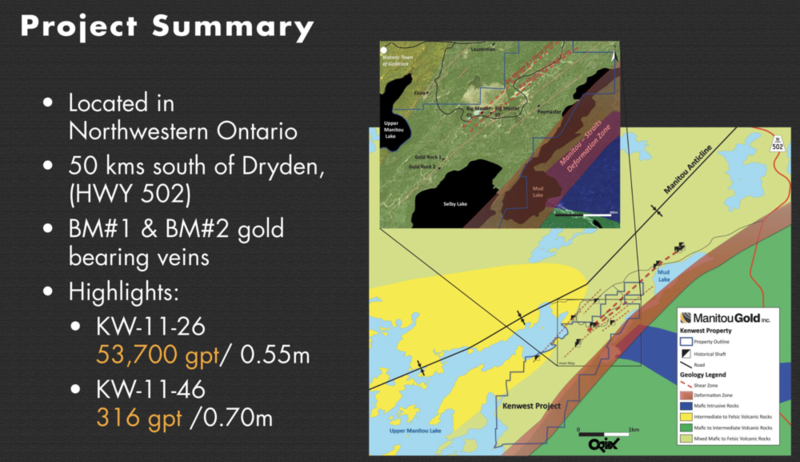 And following that period, there were major discoveries in northeastern Ontario and basically that took people from the Kenwest area and the town that had sprung up there, called GoldRock. People migrated in masses east to mining camps like Timmins and Kirkland Lake and Cobalt. So certainly Kenwest has got a prolific history. The area supported a town that sprang up on the north shore of a nearby lake, and we've been very, very fortunate to have been able to purchase Kenwest from Gold Corp when we founded Manitou Gold. Before the interview, you were talking a bit to me about the Goudreau area properties, can you talk to us about that and the significance of the claims? ﻿Yes, so this is the Goudreau properties we've got, located north of Wawa in Ontario. It's an area that we were interested in for the past two years. Approximately one year ago, we were able to secure our first land adjacent to a past producing mine called the Cline Mine, and what really triggered more of our interest and more efforts was the takeover of Richmont Mines by Alamos Mining. They purchased that for just under a billion dollars a year ago now. So we really got the acquisition bug, and we went ahead and purchased directly from three different junior mining companies that had land packages in the area, an additional 16000 acres of contiguous lands now. So while Alamos now controls, more or less, the western half of this deformation zone and re-emerging gold belt that they've spent a billion dollars on, we spent the last year consolidating ground so now we control the eastern end of that same gold belt. It's also been announced that you've begun a new partnership with a company called GoldSpot Discoveries. Can you talk to us about this and tell us why this partnership could prove game-changing for the mining sector in general and for your company as well? Certainly, GoldSpot Discoveries is a company that just became listed on the Venture Stock Exchange two weeks ago, now. What they do is bring artificial intelligence and machine learning into the mineral exploration space. So the first company to have proven this, they've got a long list of major mining companies as clients and as shareholders. So they work with the likes of McEwen Mining, Yamana, Hochschild, and they've worked with GoldCorp in the past. So these guys bring something that is proven now through the senior mining companies. Manitou Gold is the first junior mining company that they've decided to partner with and invest in. So we think that we'll be the first junior to bring these new tools into the mineral exploration space. That's going to provide the game-changing opportunity that you've alluded to. So with your wealth of experience, Richard, how do you currently view the mining sector and for gold in particular? Are we perhaps near the end of the bear market for gold and for junior gold stocks? I take the consensus that it's been many, many years of downturn in the gold price, and a much more profound downturn in investment in mineral exploration. So certainly, I believe that inflation has to begin to re-emerge. That's going to be good for the gold price, and the more uptick you see in the gold price results in more re-emerging interest in investing in mineral exploration. The other big factor, I think, that exacerbated the decline in exploration expenditures and investments, is the alternate investments that a lot of our potential investors have migrated into over the last two to three years, whether it's cryptocurrencies initially, and over the last year, certainly, people have migrated with their investment dollars into the cannabis space. So a lot of those things are maturing, those individuals that would invest in our space are now flush with cash in a time when it looks like gold's going to be turning around. I'm very optimistic that in the near-term to mid-term, people who have an interest in investing in mineral exploration are going to be returning with money to spend and invest. 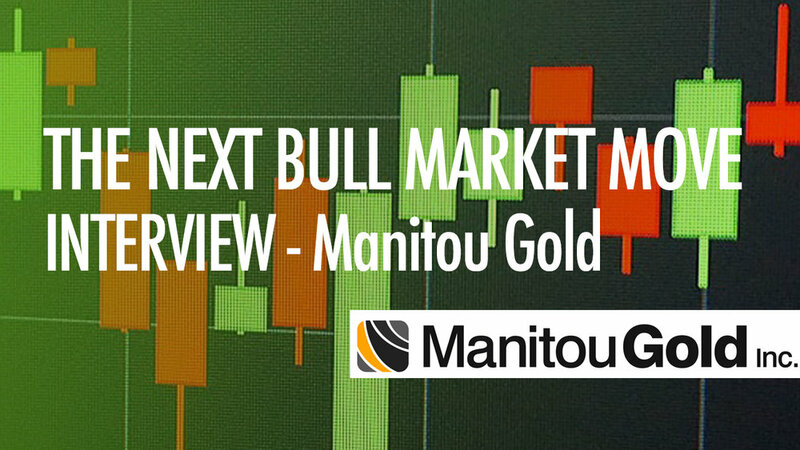 As we begin to wrap up, Richard, how would you describe Manitou Gold to potential investors, and what plans do you have for the rest of the year? I think we've positioned Manitou in two established gold camps. They're both in Ontario. One, at Kenwest, an area of past production, and the Goudreau area, right adjacent to Alamos Gold where they've just spent a billion dollars acquiring an operating mine. Together with our brand new partnership with GoldSpot and the fact that we've been able to consolidate additional lands, keep a small amount of exploration going through the poor times, we're quite well positioned, I think, when investors do decide to return into the mineral exploration space. I think we're one of the groups that are going to attract a lot of that investment early on. I think going forward through the rest of the year, we will be active on the Goudreau property. Two of the recent acquisitions we've made, we haven't even set foot on the ground yet. They have had successful exploration campaigns by our predecessors, so I'm very anxious to get back on the ground there. Along with the field work, basic prospecting and preparing for drilling, we'll be plugging in all the data into the GoldSpot machine learning package and I think that we're going to, as a result of combining boots-on-the-ground work, as well as machine learning. We're going to come up with some pretty compelling targets to be drilled towards the latter part of the year. Excellent. Okay, well thank you very much for your time today, Richard, and I'm sure we'll have you back on the show later in the year for updates. It's been my pleasure, Kerem.